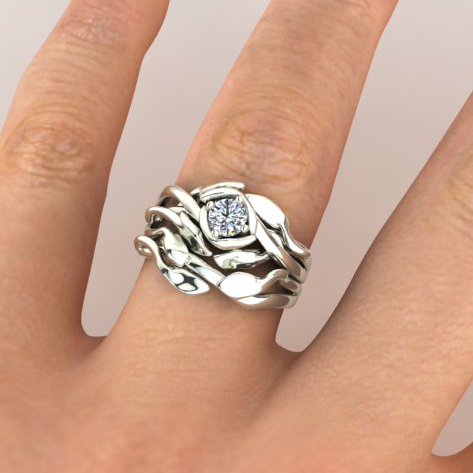 Organic leafy rings, designed and bespoke made to our client’s brief. This set is made in 9ct white gold, with no rhodium plated finish. 9ct white gold is a beautiful and subtle, lemon white colour. The alloy is just 37.5% pure gold, with the additional 62.5% being other metals, which determine the colour. 9ct white gold has silver, zinc, nickel and other metals added to the ‘mixture’ and this is what changes the original gold, to a pale, lemony-white shade. The gold will not discolour or wear away; it is the same colour throughout the rings and will never need ‘dipping’ or re-electroplating. The engagement ring was bespoke designed and made by us last year. Set with a single, brilliant cut diamond. The design cups the diamond with folded leaves, which wrap and curve around the single stone setting. The bespoke wedding ring was designed and made this year. It fits snuggly around the original diamond engagement ring, to create a perfect and completely original suite.